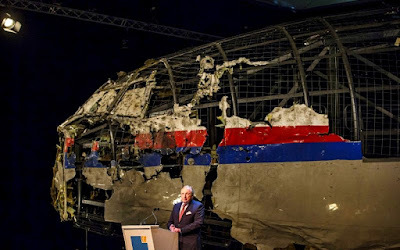 PARIS, France -- A 15-month inquiry into the disintegration of Malaysia Airlines Flight 17 in the skies over eastern Ukraine has concluded that the aircraft was most likely struck by a Russian-made missile, Dutch air accident investigators said on Tuesday. For many, the disaster brought home a struggle that had seemed distant. “Flight MH17 crashed as a result of the detonation of a warhead outside the airplane above the left-hand side of the cockpit,” said Tjibbe Joustra, chairman of the Dutch Safety Board, using a common reference to the flight number. The explosion tore off the forward part of the plane, which broke up in the air. The crash killed all 298 people aboard; the investigation found that many died instantly, while others quickly lost consciousness. “It is likely that the occupants were barely able to comprehend their situation,” the board found. The report on the July 17, 2014, crash was presented at the Gilze-Rijen Air Base in the Netherlands. The 283 passengers and 15 crew members on the flight, which was en route to Kuala Lumpur, Malaysia, from Amsterdam, came from about a dozen countries; 193 of the passengers were Dutch. The board was sharply critical of the Ukrainian authorities for failing to close the airspace above the conflict zone. It found that 160 civil aviation flights went through on the day of the crash, until the airspace was closed. “Why was Malaysia Airlines Flight MH17 flying over an area where an armed conflict was taking place?” Mr. Joustra asked. The report is unlikely to produce consensus. Based on the impact pattern, the impact angle and other data, the Dutch board concluded that the missile originated in an area of about 320 square kilometers (about 123 square miles) in eastern Ukraine. But Russian experts say the area must be smaller, and Ukrainian experts say it was smaller still. While the new report was not surprising — and is consistent with preliminary findings the safety board released a year ago — it is likely to increase geopolitical pressure on Russia. The Kremlin has denied any involvement in arming separatist fighters in eastern Ukraine or the shooting down of the Malaysia Airlines flight. In addition to studying the causes of the crash, the Dutch report examined the delay in confirming the identities of those on board — in some cases, relatives waited as long as 14 days to get confirmation — and shortcomings in the systems that governments have in place for communicating risks to commercial airliners when flying over conflict zones. On Tuesday, the company said that, as an experiment, it had detonated the type of warhead the Dutch safety board said had brought down the airplane, the 9N314M, beside a decommissioned Il-86 airplane. The intent, it said, was to demonstrate that if such a warhead were used, many bowtie-shaped pieces of shrapnel would lodge in the debris. And yet in fact, this is exactly what the Dutch board said it had discovered in the bodies of the cockpit crew. “This is not true,” Nick de Larrinaga, the European editor of IHS Jane’s Defense Weekly, said Tuesday when asked about the Russian claims. He said that both Buk types and their launchers had been on display during Russian military parades and exercises in recent years. “It’s possible that they could have been withdrawn from front-line service, but they could still be in reserve service,” Mr. de Larrinaga said in a phone interview from London. He added that a significant amount of older Russian military hardware had made its way to the battlefield during the Ukrainian conflict. Mr. de Larrinaga said that while the Dutch findings did not make it possible to categorically rule out the possibility that the missile that hit Flight 17 might have been of Ukrainian origin, he said other elements of the investigation pointed “conclusively” to the scenario that the plane was shot down by pro-Russian separatists. “There is no plausible military reason, why this aircraft — which had been flying for some time over Ukrainian territory already — would have been considered a threat by Kiev,” Mr. de Larrinaga said.